Beautiful as always Justin. Great capture! Nice and delicate rendition with wonderful softness. Congratulations on your top 20 finish. Gorgeous! Bumping up to 10. Beautiful colors on this shot. This shot also has a very nice soft feel to it. Good job. 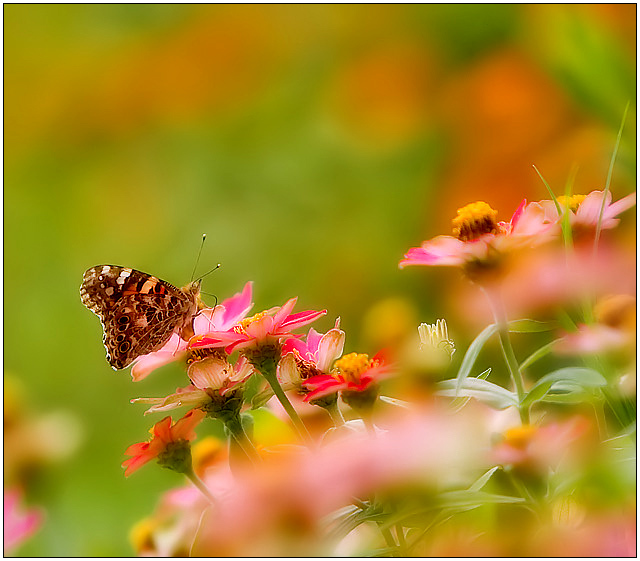 Very nice composition - the blurred pinks/oranges start in the lower center then wind all the way around and out the left side, nicely framing the butterfly/moth. Lovely soft, pleasing colors in a nice pastel palette. Beautiful and dreamy. Love the colors. This is lovely! Very nicely done! very nice capture and processing! Proudly hosted by Sargasso Networks. Current Server Time: 04/21/2019 04:49:43 AM EDT.